Caesar salad has been a popular dish since before 1930, when master chefs of the International Society of Epicures in Paris voted it the "greatest recipe to originate from the Americas in 50 years," according to What’s Cooking America. Caesar salad typically contains romaine lettuce with vinaigrette dressing topped with toasted croutons. There are a number of variations of the salad, which include the addition of meat, vegetables, garlic and other condiments. Assessing the nutrition in a Caesar salad depends on the size and ingredients in the salad. Vegetables can vary, as can the dressing and additions, such as chicken or fish. For purposes of identifying the nutritional content, the example classic Caesar salad is made with 484 grams of raw romaine lettuce. The dressing consists of a whole, raw fresh egg, 33 grams of lemon juice, 27 grams of grated Parmesan cheese and 26 grams of anchovies, canned in oil. The salad is topped with 49 grams of white, toasted, commercially prepared croutons. One cup of Caesar salad, made with the classic ingredients listed in Section 1, contains 167.5 calories, of which 125.23 are from fat. The total fat content is 13.9 grams, or 21 percent of the daily value, designated DV. Caesar salad contains 2.63 grams saturated fat, which accounts for 13 percent DV. Polyunsaturated fat content is 1.4 grams and monounsaturated fat content is 9 grams. Caesar salad contains 39.4 milligrams of cholesterol, or 13 percent DV, per cup, according to information on the FitDay website. By eliminating the anchovies from a Caesar salad, you reduce the calorie content by 60 and the fat content by 2.75 grams. Alternatively, substitute the anchovy with one slice of oven-roasted, fat-free chicken, cubed, containing only 17 calories and .08 grams of fat, as listed in the U.S. Department of Agriculture nutritional database. Calories from carbohydrates are equal to about 13 percent or 6.1 grams per cup. This represents 2 percent DV for carbohydrates, based on a 2,000 calorie diet. Caesar salad provides 1.4 grams of dietary fiber. To help meet your daily recommended amount for fiber of 25 grams, sprinkle the salad with chopped nuts or seeds, onions or other vegetables. Caesar salad is a good source of vitamins A and C, providing 38 percent DV for vitamin A per cup and 32 percent DV for vitamin C. Caesar salad is also rich in folate, providing 26 percent DV. Other vitamins in Caesar salad include 5 percent DV for vitamin E, 1 percent DV for vitamin D, 8 percent DV for riboflavin, 5 percent DV for thiamin, 7 percent DV for niacin and 3 percent DV for B vitamins B-12 and B-6. Minerals in Caesar salad include 10 percent DV for calcium, 8 percent DV for iron, 9 percent DV for phosphorus, 4 percent DV for zinc and 3 percent DV for copper and magnesium. Caesar salad contains 251 milligrams of potassium or 7 percent DV. The sodium content in the example classic Caesar salad is 266.14 milligrams, which represents 11 percent DV. The amount of sodium could be reduced by substituting the anchovy with vegetables or herbs, such as chives, parsley or garlic chips. 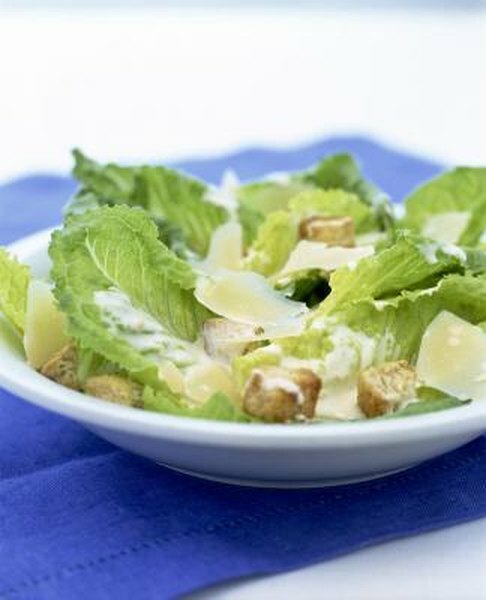 If using commercially prepared Caesar salad dressing, choose a low-fat or low-calorie dressing. One tbsp. of regular Caesar salad dressing contains 80 calories and 8.5 grams of fat compared to 1 tbsp. of low-calorie dressing, which has 16 calories and only .66 grams of fat, according to the USDA.